“The Bully Games,” this year’s Bank of America Children’s Show, produced by Syracuse Stage and the SU Department of Drama, is recommended for ages seven and up. Public performances of this year’s Bank of America Children’s Show, “The Bully Games,” produced by Syracuse Stage and the Department of Drama in the College of Visual and Performing Arts, will be held on Saturday, Dec. 7, at 11 a.m. and 1 p.m. in the Storch Theatre in the Syracuse Stage/Drama Complex at 820 E. Genesee St.
“The Bully Games” is a 60-minute performance (which includes a 10-minute post-show discussion) recommended for ages 7 and up. All seats are $8 and can be purchased by calling the Syracuse Stage Box Office at 315-443-3275. Additional support for Syracuse Stage education programs is provided by Constellation Energy Nuclear Group, Tompkins Financial Advisors and Wegmans. 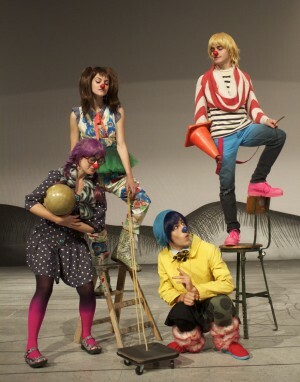 Performed as a highly physical clown show with striking scenery, costumes and sound, “The Bully Games” is an action-packed adventure of four inquisitive kids and their discovery of a mysterious old classroom with a history of bullying. Through games of status and role-playing, it explores how bullying impacts a child’s life, and how to proactively “change the game.” “The Bully Games” offers an extraordinary opportunity to share an important message through a rich theatrical experience. “The Bully Games” is devised and directed by Lauren Unbekant, director of education at Syracuse Stage. Costume and scenic design is by Moria Clinton, and sound design is by Jonathan Herter. Featured in the cast are SU Drama students Dustin Kahn (The Ringleader), Danny Harris Kornfeld (The Innocent), Carly Blane (The Transformer) and Melissa Beaird (The Trickster). The stage manager is Joseph Trevino. The fall tour of “The Bully Game” began in September and continues through early December. Approximately 5,500 children will see the production in 28 schools throughout Central New York.